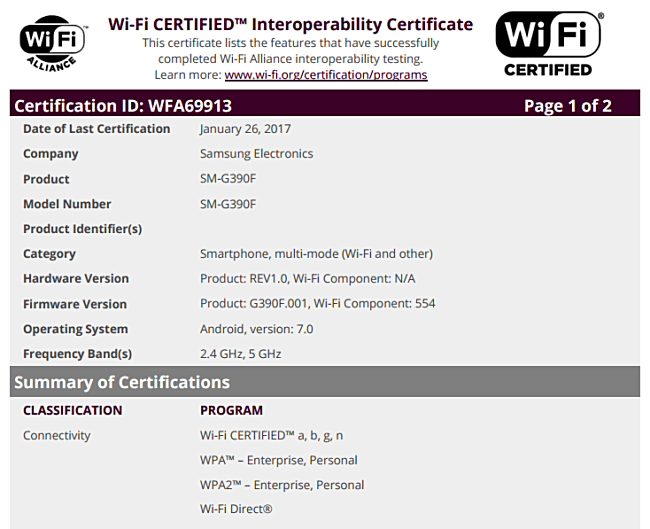 A new Samsung smartphone has received WiFi certification from the WiFi Alliance (WFA). The listing reveals that the device - which carries a model number of SM-G390F - runs Android Nougat out of the box. As for the device, going by the model number it carries, it could well be the successor to the entry-level Samsung Galaxy Xcover 3 from 2015, which launched with SM-G388F model number. There's currently no information on when the Galaxy Xcover 4 will be unveiled and what price tag it will sport, although given that it has started collecting necessary certifications, we expect to hear more about the device sooner rather than later. Xcover series isn't really meant to break ground, either literally or figuratively. I hope they dont stick with 4.5" size.